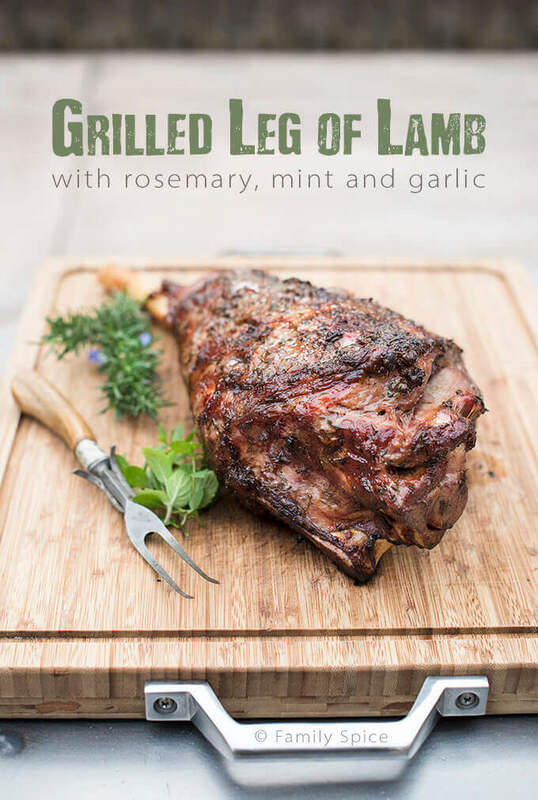 Juicy, tender and ridiculously delicious, this recipe for Grilled Leg of Lamb with Rosemary, Mint and Garlic can be made with either a bone-in or boneless version and makes an impressive meal for family and friends. There is something special about grilling meats on fire versus roasting it inside in the oven. The addition of char and smoke to meats really takes your meal to a whole new level of awesomeness. 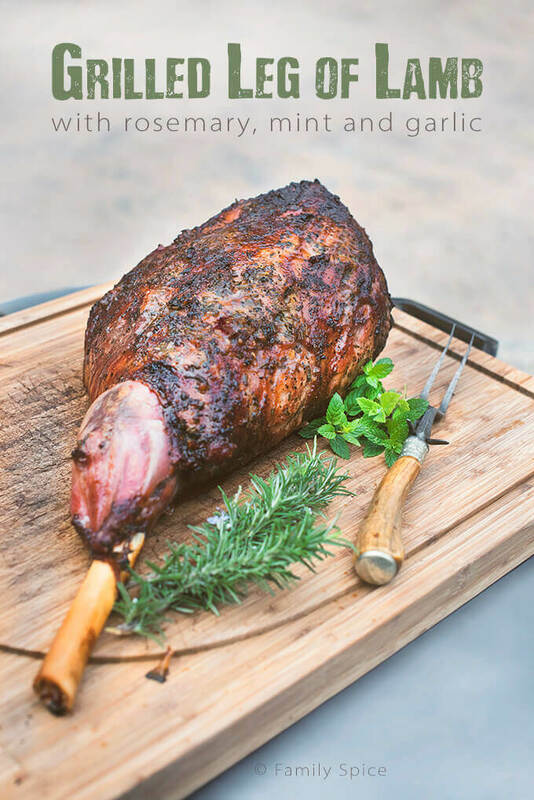 Although this post focuses on grilling a bone-in leg of lamb, you can also use this marinade for a boneless version. You can also marinate the meat and prepare it in the oven, just in case you are buried in snow and can’t quite grill yet! I must admit that purchasing our Big Steel Keg was one of our best purchases. My husband has always enjoyed grilling, but he really stepped up his game when we upgraded our grilling gear. So before the Keg, we had the traditional gas grill. 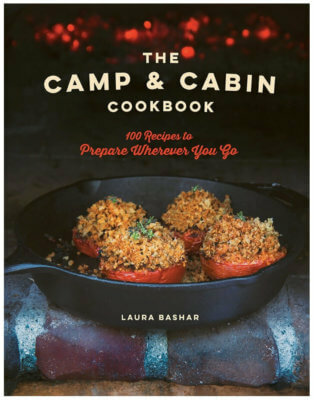 Now I don’t want to knock down the gas grill, it is super convenient to cook with – just like cooking with my gas stove top inside the house, except I can stick the meat right on the grate. Although you get the charred, fire roasted sensation from you foods, a gas grill doesn’t give you the smokey flavor you can get with the use of hardwood charcoals. 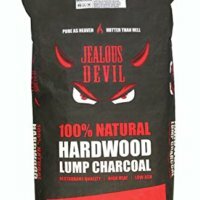 Yes, you can add a smoker box, we used to do that, but the flavor does not compare with cooking over hardwood charcoal. For the past couple of years, my husband has perfected beef brisket and pork shoulder using our Big Steel Keg. You can control the internal temperature of your grill by adjusting the vents on the top and the bottom of the grill. But that means you have to be home managing the grill, or texting your wife to keep checking the grill while you are out running some random errands while your meat cooks. Low and slow cooking is definitely an art, and it absolutely requires patience. But it is oh-so-worth the time and love you put into it. 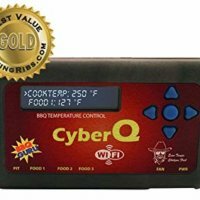 Another investment we made into our grilling equipment, is the addition of the BBQ Guru’s CyberQ Wifi BBQ Temperature Controller. I won’t lie. When my husband told me he wanted this thing, I rolled my eyes and thought, “Oh, no! Not another electronic toy we don’t need!” as well as “How much is that thing??! 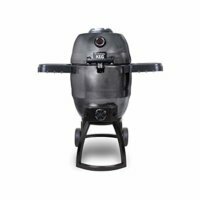 !” But we saw the benefits of using the BBQ Guru from day 1. The setup: You have two temperature leads, one inserted into the meat you are grilling and the other in the grill itself. You set the grill temperature and the meat doneness temperature into the BBQ Guru. The kit comes with this little fan that regulates the grill temperature. You can also determine how often the BBQ Guru emails you with temperature updates. For example, we set ours to 10 minutes. Of course, you get an alert to your phone with the meat has reached the internal temperature you have set. 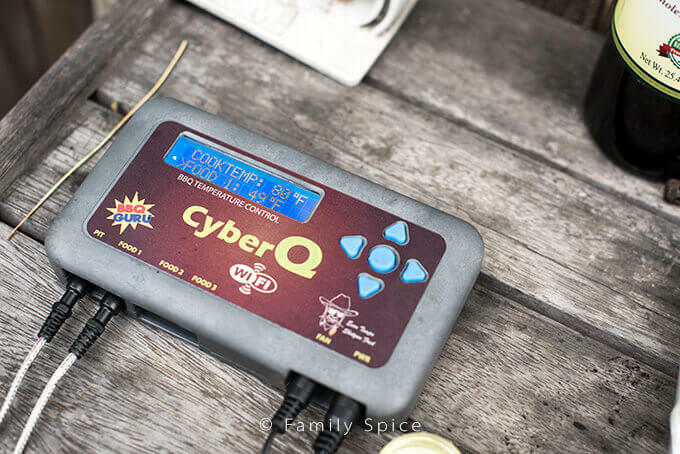 Now, you do not have to wait for the alerts to learn about the current temperature of your grill and meat – you can check it anytime with the use of your smart phone. Now this lamb recipe only takes a couple hours on the grill to cook. That’s no big deal. But when you are cooking a brisket or pork shoulder for 6-8 hours, well, being chained to the grill can be rather boring. Our first time using the BBQ Guru we made a pork shoulder roast, which required 8 hours on the grill. While it was cooking, we went to the beach and enjoyed a couples hours of sun and surf. The hubby was giddy when he received updates from his grill while boo. 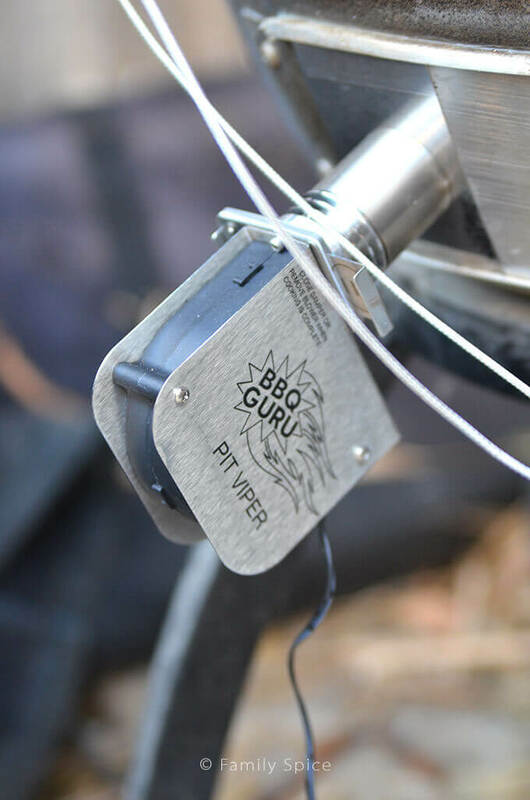 My skepticism vanished after that first day using the BBQ Guru. No more constantly going outside to check the grill. No more texts from my husband asking me to check on the grill. Just perfectly grilled meat with as little hassle as possible. 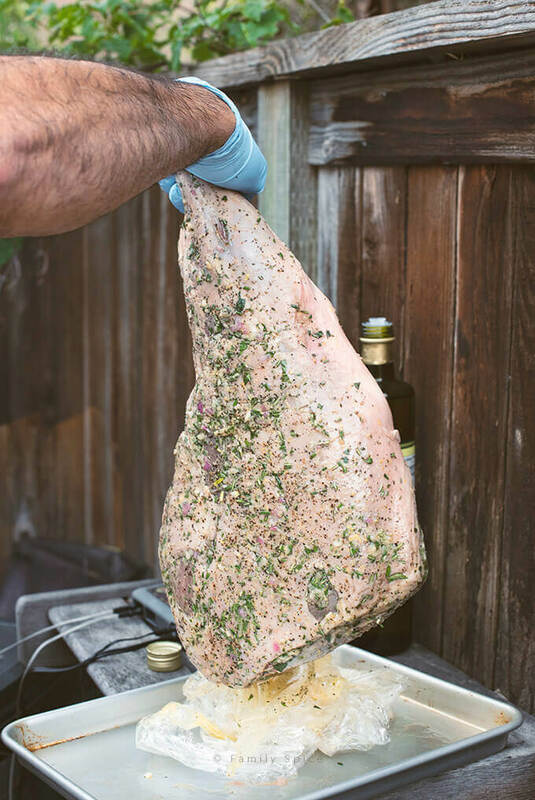 Before you grill or roast your leg of lamb, it does require a minimum of 4 hours marinating time. I prefer letting the lamb sit in the marinade for longer, up to overnight, for optimal flavor. The marinade is fairly simple but full of flavor and impact: fresh herbs like rosemary and mint mixed in with garlic, shallots, lemon zest and extra virgin olive oil. You rub this past all over the leg of lamb, cover it with plastic wrap and keep in the refrigerator. As with most meats, you should let the meat come to room temperature before grilling/cooking. So be sure to add that time in your preparations. This Grilled Leg of Lamb turned out beautifully on the grill. I usually grill a boneless butterflied leg of lamb marinated in yogurt. I am happy to report that it was perfectly tender and juicy, and this marinade was super easy and incredibly aromatic. 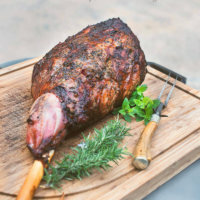 We have now made this bone-in grilled leg of lamb several times and it gets inhaled super quick. You can eat it with freshly roasted vegetables and potatoes, or with basmati rice. You can even make sandwiches with the lamb and serve it with pita bread and mast-o khiar (Persian yogurt with mint, dill and cucumbers). Just like the meat thermometers you use in your oven indoors, for accurate readings, remember to insert the thermometer into the thickest part of your meat, without touching any bone. Letting the meat rest after removing from the grill allows the juices to get absorbed back into the meat. With a sharp knife, slice deep slits all over leg of lamb. In a bowl, combine remaining ingredients and make a paste. Place the leg of lamb on a large baking sheet and rub herb mixture all over and stuff into the slits. Cover entire lego of lamb with plastic wrap and let marinate in the refrigerator for 4 hours or up to overnight. 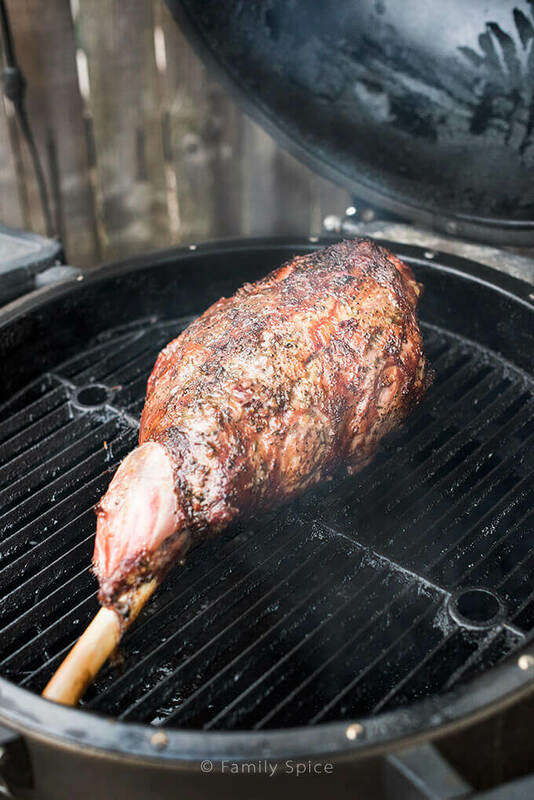 Remove leg of lamb 2 hours before cooking to allow meat to come to room temperature. If you using a Big Steel Keg or Big Green Egg, add coals or wood charcoal and heat grill to 325ºF. If using a gas grill, preheat grill with all burners on high. After 15 minutes, turn off the center burners and reduce the outer burners to medium. 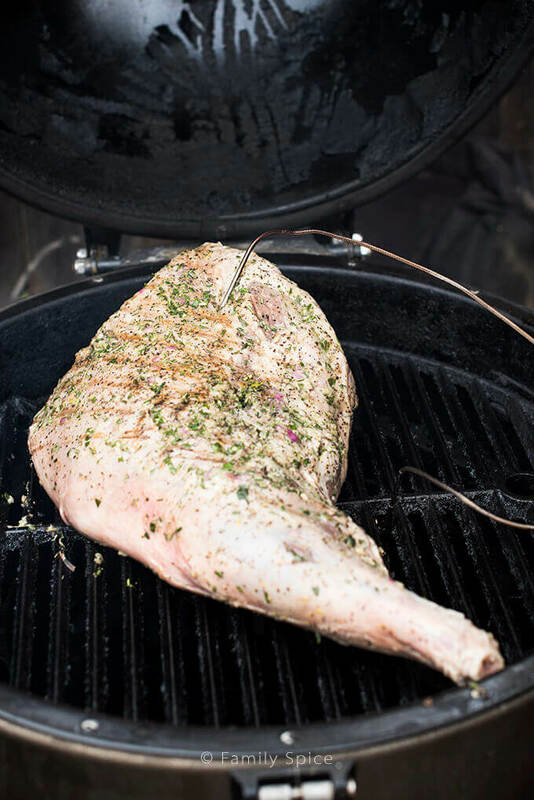 Place the lamb in the center of the grate and grill covered for until internal temperature reaches 140ºF, approximately 2 hours. Remove lamb from grill, cover with foil and let rest for 10 minutes before carving. To cook in the oven, prepare lamb the same way. Preheat oven to 325°F and roast in a roasting pan until internal temperature reaches 140ºF, approximately 2 hours. Disclosure: I was NOT paid to write this post. I purchased the Big Steel Keg and the BBQ Guru with my own money. This post does include affiliate links.